EDMONTON, AB – The Autumn 2017 issue of the Alberta Craft Beer Guide, a quarterly publication covering the craft brewing scene in the westernmost prairie province, is being released this week with launch parties in Calgary and Edmonton. The guide has grown from 68 to 116 pages and jumped from 38 to 58 brewery profiles. The maps and directory allow an easy navigation of all of the local breweries plus the ”Soon-eries & Rumour-ies” section offers insight into the 30+ breweries at various stages of planning. Articles from this time around touch on Cask Beer, Haunted Brewery History, Potato Chip & Beer pairing, and more. The new issue will be officially debuting in Calgary on Wednesday September 13th at Caravel Craft Brewery (Bay #12, 10221 15 Street NE) with an event that will feature the first bottle releases from Caravel, music by Island in the Sky, and food from Lil’ Truck on the Prairie. Tickets to the free event can be reserved online. The Edmonton launch will follow next Tuesday September 19th at The Common Restaurant (9910 109 St NW) with a ticketed event featuring beer from five Alberta breweries, a beer cocktail by Strathcona Spirits, dinner by Chef Jesse Morrison-Gauthier, and a live DJ. Advance tickets are $45, and can be purchased via Eventbrite. 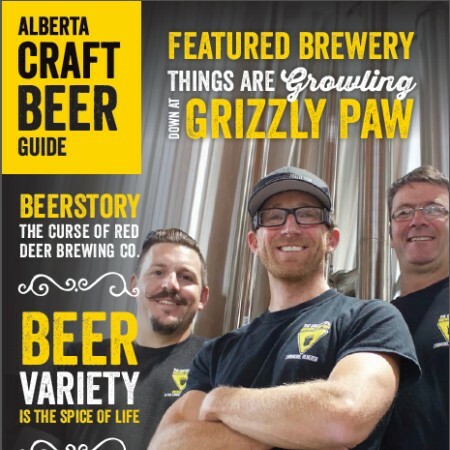 The Alberta Craft Beer Guide will be available at breweries, liquor stores, bars and beer events throughout Alberta, retailing for $2 per copy in most locations.